Executive Master in EU Studies - subscribe until 5 September 2018! Combine work with study and enjoy EU expertise for professionals: interdisciplinary and international! For more information and subscription, please find out more here: http://www.eu-online-academy.org/. Call for Applications for the "Master in Global Energy Transition and Governance"
The Centre international de formation européenne (CIFE) is proud to announce the start of a new Master's programme in October 2016: The Master in Global Energy Transition and Governance aims to give a deep understanding of the complexity of the current energy transformations in Europe and worldwide. The latest issue of the quarterly journal L'Europe en formation is dedicated to the relations between the European Union and Central Asia and developments in contemporary Central Asia. Scholars from both regions deliver analyses covering the realms of democracy, natural resources, security and the regional perspective. Call for Applications for the "Master in EU Studies Online"
After the graduation of the second class of EUCAIS participants, the Centre international de formation européenne (CIFE) continues to offer a two-years master programme “Master in EU Studies Online”. We are looking forward to applications of professionals from Central Asia, seeking to deepen and expand their knowledge on the EU integration process while pursuing their careers. 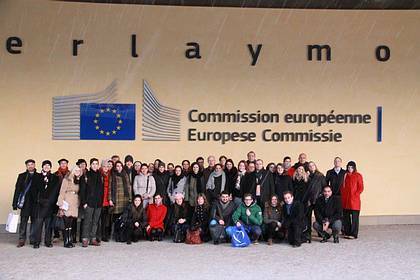 The individual research work is a highly important element of the EUCAIS Master programme. On the basis of the methodological knowledge gained in the appropriate courses on research methods and their application to real research questions, students chose a topic from a list of subjects proposed by the faculty or proposed a topic on their own. The spectrum of subjects of the master theses ranges from EU – Central Asian relations, European and / or Central Asian integration processes, to current developments within Central Asian countries and their regional and international interactions. 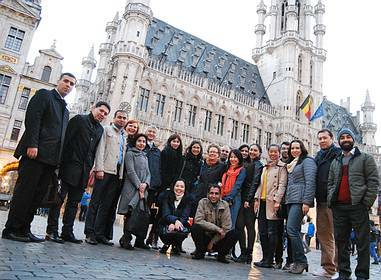 From March 18th until March 25th 2015, the 4th and final workshop of the 2013-2015 EUCAIS class took place. The workshop started in Berlin, the place where the programme kicked off in September 2013. Students completed their last semester by taking their written exams in European and international law and one optional course. Furthermore, the master students defenced their master theses, that they had been writing since August 2014, before their supervisors and their classmates. After having completed these final examinations, the EUCAIS participants enjoyed a two-days study trip to Brussels, where they benefitted from numerous briefings in the core European political institutions: In the European External Action Service and the European Commission, students discussed with policy officers not only about the organisation and role of both institutions in general, but with regards to the EU’s policy towards Central Asia in particular. In the European Parliament, students listened to a presentation of Sven Giegold, member of the European Parliament, about the current trends and challenges of the EU’s economic and financial policy. The European institutions’ visits were complemented by a meeting and academic discussion with Dr Neil Melvin, Senior Fellow at the Stockholm International Peace Research Institute (SIPRI) and member of the EUCAM advisory group, on the transforming security context of Central Asia. Last but not least, the EUCAIS participants discovered the Parliamentarium museum in Brussels that provides a very lively presentation of the European integration history, and enjoyed a guided walk through Brussel’s European quarter with explanations by Mr Hajo Friedrich, working as a journalist in the Brussels political environment. The workshop has been completed by an oral evaluation of the program and a farewell dinner, where the participants were congratulated by the program administrators upon their successful completion of the EUCAIS master programme. As this EUCAIS class met for the last time in the framework of this workshop, the event was also the moment when students had to bid adieu from the classmates, unless, as a result of the programme, many participants had made new contacts and will keep in touch with each other. The Institut für Europäische Politik (IEP) and its partner the Centre International de Formation Européenne (CIFE) have organized an international conference in Almaty, Kazakhstan from the 28th to the 29th of August 2014. 70 participants gathered at the conference in Almaty, made up of our EUCAIS master students, several EUCAIS alumni and a number of speakers and attendees. 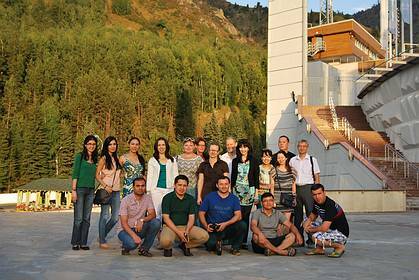 From 23 until 30 August 2014, the third workshop of the online master programme „Studies on the EU and Central Asia in the International System“ (EUCAIS) took place in Almaty, Kazakhstan. It was the kick-off for the programme’s third semester and, at the first time since the launch of the programme in 2010, took place in a Central Asian town. The workshop has been attended not only by the programme’s current students, but also by EUCAIS alumni students, who benefitted from the workshop’s lectures and contributed to the networking among the present and alumni students and experts. During the workshop, students had to take the second semester’s written exams and attended the introduction to the third semester’s courses. In the third and last semester of the EUCAIS programme, students will learn the basics of European and international law and choose one optional course in either world politics, resource and energy policy of the EU, or comparative regionalism. In addition, the students start writing their master theses that will be finalized and defended at the beginning of 2015. Besides these mandatory components of the master programme’s workshop, students benefitted from the opportunity to take part in an international conference on the “Prospects of EU - Central Asia Relations” that took place in the same venue on 28 – 29 August 2014. This conference has been organized in the framework of the EUCAIS master programme, that is organized by the Institut für Europäische Politik (IEP) and the Centre international de Formation européenne (CIFE) with support of the Volkswagen Foundation and funding by the Jean-Monnet-Programme of the European Union. The conference was an excellence opportunity to exchange ideas and knowledge for representants from academic, political and societal institutions of both regions. Additional to plenary sessions on regional cooperation, natural resources and security challenges within Central Asia as well as on the prospects of both regions’ potential of cooperation, participants presented and intensively discussed papers in four working groups: comparative regionalism, security challenges, democracy promotion and developments in research and teaching in Central Asia. Apart from the workshop and conference programme, students, alumni and conference participants discovered Almaty and its surroundings, as for most participants the visit in Kazakhstan was a premiere. Insofar, the event also contributed to the cooperation and understanding in between Central Asian countries. CIFE is offering an internship in Berlin! Centre international de formation européenne (CIFE) is offering an internship in Berlin from mid-September till mid-December 2014! Apply now! 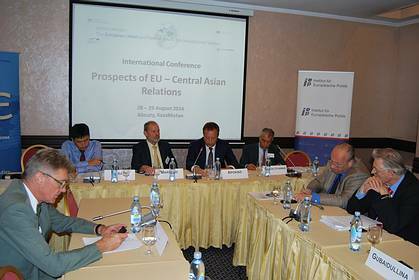 The Institut für Europäische Politik (IEP) and the Centre international de formation européenne (CIFE) are organising a high-level international conference on the “Prospects of EU-Central Asia Relations” in Almaty on the 28 and 29 of August 2014. The current developments and prospects of EU-Central Asia relations will be discussed with high-level speakers from Europe and the wider Central Asian region as well as researchers and PhD candidates. They have the chance to present their research projects in the international conference and receive feedback from renowned researchers. The conference offers them networking opportunities with other researchers, university professors and lecturers from Europe and the wider Central Asia. It aims at establishing a European-Central Asia research network. IEP and CIFE invite researchers and PhD candidates to submit paper proposals by 9 June 2014. For details see the Call for Papers. 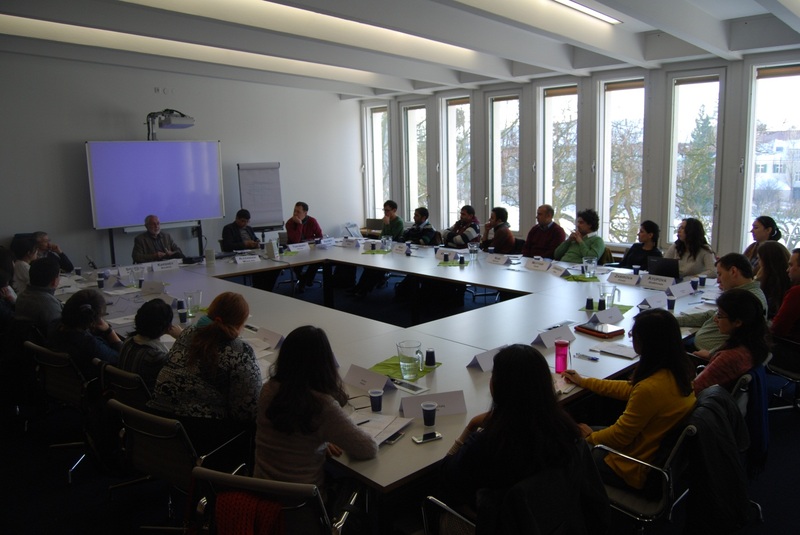 From January 27th through February 3rd 2014, the second workshop of the online master programme „Studies on the EU and Central Asia in the International System“ (EUCAIS) took place in Berlin. The first e-learning period for the master programme’s second class of students, organized by the Institut für Europäische Politik (IEP) and the Centre international de Formation européenne (CIFE) with support of the Volkswagen Foundation and funding by the Jean-Monnet-Programme of the European Union, was closed with written exams at the beginning of this workshop. Over the course of the workshop, the students completed an intensive study programme and obtained an outlook to the upcoming second semester. In addition, the participants benefited from the opportunity to personally interact and further develop relationships. Besides the seminar programme, the students discussed the “German – Central Asian economic relations and their potential” with Mr Frank Weisig, Desk Officer Kazakhstan/Turkmenistan, at the Federal Ministry for Economic Affairs and Energy. This was followed by a visit to the Berlin Wall Memorial Bernauer Straße, where the participants dealt one more time with questions concerning the history of European integration. Another highlight of this workshop was a 2-day simulation game on international negotiation with Dr. Alexander Mühlen, Ambassador in retirement. The e-learning of the second semester which lasts from February to July 2014 was successfully kicked-off with this workshop. From September 23rd through the 27th, the first workshop of the online master programme „Studies on the EU and Central Asia in the International System“ (EUCAIS) took place in Berlin. The e-learning period for the master programme’s second class of students, organized by the Institut für Europäische Politik (IEP) and the Centre international de Formation européenne (CIFE) with support of the Volkswagen Foundation and funding by the Jean-Monnet-Programme of the European Union, began in August. The 30 students from Afghanistan, Kazakhstan, Kyrgyzstan, Tajikistan, Turkmenistan, Uzbekistan as well as from the Chinese province of Xinjiang and the Indian region of Kashmir were welcomed through an official opening ceremony hosted in the Europäisches Haus in Berlin on September 23, 2013. Representing the European Commission in Germany, Marzenna Guz-Vetter conducted the programme’s welcoming address. Following were short speeches given by the programme’s organizers, Mathias Jopp and Hartmut Marhold, as well as a welcoming address by Wolfgang Levermann, a representative of the Volkswagen Foundation. Marc Bogdahn, head of the division Southern Caucasus and Central Asia, Foreign Office, Berlin, provided a look at the relations between the EU and the Central Asian states from a German perspective. His speech was followed by a lively discussion on the future of these relations. Over the course of the workshop, the participants not only completed an intensive study programme and obtained an outlook to the upcoming semester, but.also had the opportunity to personally interact and establish contacts. In addition to the seminar programme, the students discussed the functioning of the German Parliament and the work of a member of parliament with Claudia Schur, head of press and communication in the office of the member of German Parliament Stephan Mayer.. Karoline Münz, Vice – general secretary of the European Movement Germany (EBD), provided the students with insight into the work of the EBD and its member organizations. This was followed by a visit to the Topography of Terror, where the participants dealt with specific German questions concerning the history of European integration. 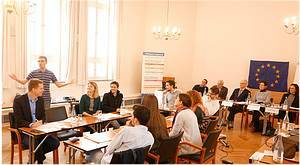 After the graduation of the first class of 25 students, the Institut für Europäische Politik (IEP) and the Centre international de formation européenne (CIFE) continue the master programme “Studies on the EU and Central Asia in the International System” in August 2013. Thanks to significant funding from the VolkswagenFoundation and additional financial support by the Lifelong Learning Programme Jean Monnet of the European Commission we can offer 30 young academic professionals from Afghanistan, Kazakhstan, Kyrgyzstan, Tajikistan, Turkmenistan, Uzbekistan, as well as from the Chinese region of Xinjiang and the Indian region of Kashmir the chance to obtain a master’s degree in “Studies on the EU and Central Asia in the International System”. The programme will start in August 2013. It will last three semesters, six months each, and will conclude in March 2015. The “Central Asian Online Academy” is organised on a part-time basis, allowing its students to pursue their careers at home, as well as additional workshops in Berlin, Brussels and Central Asia. The programme is open to postgraduates and young professionals from Afghanistan, Kazakhstan, Kyrgyzstan, Tajikistan, Turkmenistan, Uzbekistan, as well as from the Chinese region of Xinjiang and the Indian region of Kashmir.